Mage Wars Academy features gameplay similar to Mage Wars Arena (née Mage Wars) with two mages in head-to-head combat to see who will be victorious. Mage Wars Academy is a two-player starter set that features two mages, two spellbooks, and a new "boardless" gameplay design that's more portable and fast-playing than Mage Wars Arena. 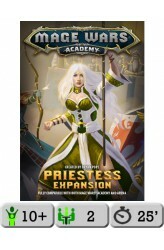 All of the spell cards included in Academy are compatible with those in Arena. Multiple core sets (or future expansions) can be added together to create a 3 or 4 player game. https://youtu.be/wfCsTguaTR4 ..
What would it be like for Mages of vastly different schools and philosophies of magic to come together in an arena and fight to the death? How would an Illusionist battle a Druid? Or a Warlock fight a Beastmaster? Or a Priestess fare against a Wizard? 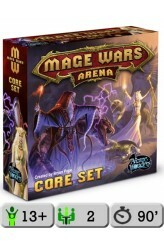 Mage Wars — redubbed Mage Wars Arena in 2015 to distinguish it from Mage Wars Academy — pits powerful Mages against each other in deadly arena combat. Each Mage uses his own fully-customizable book of spells to achieve total victory over his opponent. Summon mighty creatures to do battle in your name; cast powerful spells to attack your foe and thwart his every plan and strategy; use hidden enchantments to turn the tables and rule the day; adorn yourself with mighty weapons, armor, and arcane artifacts – all of this and more await you ..
Mage Wars: Academy – Priestess Expansion includes a new mage for use in both Mage Wars: Academy and Mage Wars: Arena. Now you can play as a holy Priestess competing to prove that the way of light is absolute by letting her smite the wicked and summon virtuous allies. 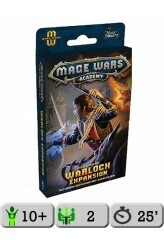 ..
Mage Wars: Academy – Warlock Expansion is an expansion for Mage Wars. A new student has enrolled at the Academy! The nefarious Warlock seeks to prove the way of darkness is unequaled as he summons shadowy denizens and casts secret enchantments to curse his enemies! 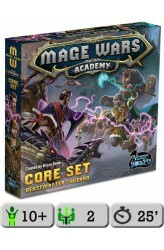 Compatible with both Mage Wars Academy and Arena, this character expansion comes with 72 Spell Cards, game markers, and complete rules. 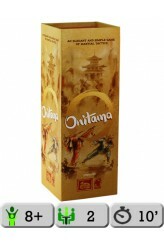 ..
Onitama is a two-player, perfect information abstract game with a random starting set-up. On a 5x5 board, both players start with five pawns on their side, with the main pawn in the middle. Each player has two open cards that each display a possible move for any of his pieces. There is a fifth card that cannot be used by either player. On a player's turn, he chooses one of his cards, moves one of his pieces according to the chosen card, then replaces the card he used with the fifth card. The other player then chooses one of his cards, moves accordingly, and exchanges that card with this fifth card — which is, of course, the card the first player just used. Moving onto one of the opponent's pawns removes that pawn from the game. Taking the opponent's ma.. 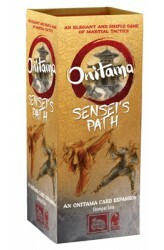 The Onitama: Sensei's Path expansion consists of sixteen new movement cards that can be shuffled together with those of the Onitama base game in order to have more variety during play. https://www.youtube.com/watch?v=Q_QDL9J2BtA ..
Once again, rival schools have come to Onitama to see who has the dominant Art — but something is different this time: Their activity has attracted the attention of a wind spirit! This indomitable force will interfere with the students, but it may on occasion grant an unforeseen benefit as well! 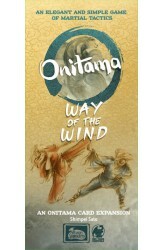 Onitama: Way of the Wind, an expansion for Onitama, includes a wind spirit, a neutral game piece that creates a new layer of interaction in the game. Two new move cards are included, as well as eight wind spirit cards. Includes 8 New Wind Spirit Cards: Bat Eagle Hawk Lion Octopus Rhinoceros Scorpion Spider 2 New Move Cards: Goat Sheep 1 ..
RWBY: Combat Ready is an exciting cooperative game for 2-4 players. 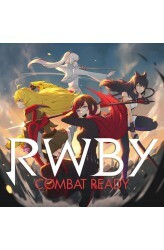 It captures the flavor and excitement of the animated web series RWBY from Rooster Teeth, with fast-paced battles, where all players are actively involved and engaged at the same time. Players play as one of the four main heroines in the series: Ruby, Weiss, Blake, or Yang. Each of them have their own separate deck of cards, representing their attacks, actions, and moves. 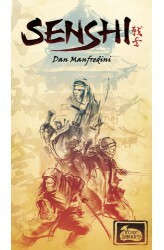 Each character plays a little differently, using their own unique tactics and strategies. Players record their key stats on their Scrolls (player tracking boards), including their Aura (health), Experience, Battle Fury, and their Semblance (unique special ability). Before each game, players choose a scenario to play from t..
You are a senshi, a warrior-monk studying diligently at the temple under the tutelage of the current master. You and your fellow students train vigorously every day to improve your mind and body, but your master is ailing, and only one senshi will become the next master. To prove your worth, you must develop four attributes: strength, agility, wisdom, and honor. A true master must be strong in all of these, and weak in none. Senshi is a strategy game for 2-4 players that takes only 15 minutes to play! Carefully manipulate stacks of tiles that represent your four attributes: strength, agility, wisdom, and honor. Competing in a battle of wits, players will choose one of three actions each turn: study to take stacks of tiles, train to take a single tile off any.. Prince John is coming to Nottingham! Players, in the role of merchants, see this as an opportunity to make quick profits by selling goods in the bustling city during the Prince's visit. However, players must first get their goods through the city gate, which is under the watch of the Sheriff of Nottingham. Should you play it safe with legal goods and make a profit, or risk it all by sneaking in illicit goods? Be mindful, though, as the Sheriff always has his eyes out for liars and tricksters and if he catches one, he very well may confiscate those goods for himself! 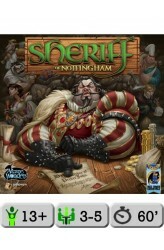 In Sheriff of Nottingham, players will not only be able to experience Nottingham as a merchant of the city, but each turn one player will step into the shoes of the Sheriff himself. Players declare goods they wish to bri..
Sheriff of Nottingham: Merry Men contains five modules that can be added to the base game, as well as the option of including a sixth player. The five modules are: Deputies: In six player games, you may use two Deputies instead of a single Sheriff. Here, both deputies must decide to search bags or let people pass, and they will share the punishments and rewards. If a deputy disagrees with the other and searches a bag, they will receive the punishment or reward by themselves. 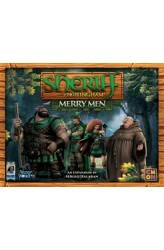 Merry Men: Adds new illegal goods in the form of 'merry men' characters. If they are successfully smuggled in, players will reveal it and activate its special ability. Black Market: Adds three sets of bonus cards that display illegal goods. The first player who success..
You are a VIRUS that has just infected a human body. Now you have to spread out and mutate your virus in order to infect other organs to gain VIRAL POINTS. But watch out for the other VIRUS controlled by other players and the powerful IMMUNE SYSTEM! 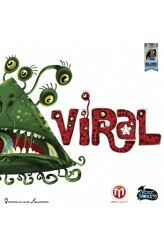 VIRAL is a 2-5 players competitive boardgame in which each player controls a virus that is growing inside a human body. Players will simultaneously play cards to place tokens on the board and move them around to gain control of zones to score Viral Points. Players also score points when they cause a crisis in an organ and thus activating the anti-virus (the immune system). Players also can play cards that allows them to attack other players. The player with the most Viral Points when the event deck runs out is the winner of the game..